CounterPath has long been known for its SIP softphone clients, Xlite and Bria. Xlite is a free PC-based softphone client which provides basic voice calling and instant messaging features. Using the iPhone or iPod’s existing contact list, Bria iPhone Edition facilitates easy and effective communication management with an intuitive interface that accommodates multiple calls. Call functionality includes the ability to swap between two calls, merge and split calls and perform attended and unattended transfers. 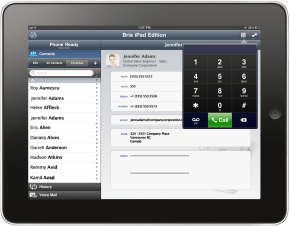 Unlike other VoIP voice applications marketed for the iPad that were introduced primarily for the iPhone, Bria iPad Edition is designed specifically for all Apple iPads. This iPad-centric foundation means that Bria iPad Edition leverages the device’s large, high-resolution display, providing a richer user experience that enhances the features found in the Bria iPhone Edition. Bria iPad Edition’s separated navigation panes make it effortless to find contact information and initiate calls. A one-touch popover dialpad is elegantly minimized yet easily accessible at all times, while the iPad’s native keyboard is also available for entering alphanumeric SIP URL/addresses. During the past year I have set up Bria on a MacBook and iPhone, using it as one of my “phones” that is hooked up to my FREETALK Connect telephone system. Yesterday I added Bria iPad Edition to my iPad and have done some inbound and outbound test calls through the FREETALK Connect. Effectively my iPad has become one more “phone” when using the FREETALK Connect’s “Find Me” feature where calling my extension rings a Linksys IP phone, my Skype client, my BlackBerry (via an external call) and my iPad. I made a call with Alec Saunders who also has the same configuration; both iPads were connected via WiFi to our local LAN, each of which included a FREETALK Connect. During the call I was able to record our conversation; the screen had options for transferring the call, adding a third party and either accepting or placing another call. With all three smartphone/tablet editions, Bria interfaces to the device’s local address book and runs in background to answer calls while running other applications. During a call I also confirmed that you can also reference other applications while the call is handled in the background. As shown in the images from the call screen it also includes features such as multi-call support, call transfer and three-way calling. 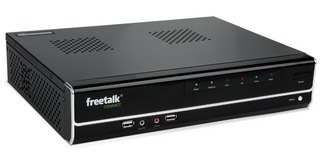 My only concern is that it requires some technical knowledge to configure with the FREETALK Connect but that is a one-time exercise. While my experience involved a business telephony system, Bria iPad Editon comes preconfigured to work with several SIP service providers and it can be manually configured for any SIP-based service. During a call with Todd Carothers, CounterPath’s Senior Vice-President Marketing and Products, , he pointed out that one of their learning experiences with these Fixed-Mobile convergence clients was how to deal with bouncing between WiFi and 3G connections in, say, a multi-level building. Basically they will incorporate into Bria a button that provides control over this situation by moving the call between 3G and mobile at the user’s discretion. Also Bria will soon be incorporating features to support SMS messaging and video calling. Bottom line is that with Bria iPad Edition, my iPad has become a fully-featured IP phone that can be used through an business-grade telephony system for small business from any location worldwide provided there is a wireless Internet connection. Bria iPad Edition is available at the iPad App Store at a price of $14.99. Full disclosure: The producer of the FREETALK Connect has previously been a client of the publisher’s business development services; at this point, there is no business relationship. The publisher is opening a business providing consulting to small businesses who want to implement Skype and/or IP-based communications solutions. More details to follow next week. CounterPath’s Bria is simply one of the softphone products experienced over the past year while determining configurations that work with FREETALK Connect.